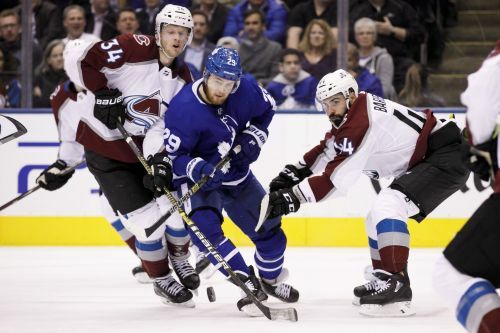 TORONTO (AP) — The Colorado Avalanche caught the Toronto Maple Leafs in a lull and took full advantage. Carl Soderberg had his first career hat trick and the Avalanche defeated the Maple Leafs 6-3 on Monday night. "We were going tonight," Soderberg said. "I'm glad we could get a win." "We just didn't win enough races, enough puck battles," Leafs center John Tavares said. "It starts with guys like myself, we have to do a better job consistently." The Maple Leafs talked ahead of Monday's game about how matching a reeling opponent's desperation level would be crucial. They didn't come close. "We've only got ourselves to blame," Leafs head coach Mike Babcock said. "This is not good enough." Soderberg broke a 3-3 tie midway through the third when he snapped his 14th goal of the season past Andersen off a pass from J.T. Compher after Colin Wilson won a battle behind Toronto's net. "Everyone is getting better and we've hit a lull," Babcock said. "We've got to get turned." With some of the fans at Scotiabank Arena booing Leafs defenseman Jake Gardiner every time he touched the puck after a soft play led directly to Soderberg's short-handed score in the second period to make it 3-2 for the visitors, Marner tied the game six minutes into the third. The winger took a pass from Travis Dermott and ripped his 18th goal of the season and third in as many games past Varlamov's glove. Toronto went right back to work and scored 11 seconds after play resumed — four seconds in game time before the puck entered the net on Lindholm's effort — when Kapanen snapped a seven-game drought with his 15th. Andersen did well to stop MacKinnon on a partial breakaway and Wilson's quick backhand, but could do nothing when Rantanen stripped Nazem Kadri in the Toronto zone and scored his 21st at 9:56. Soderberg then made it 3-2 on his 13th with 5:31 left in the second when he outmuscled Gardiner for the puck late in a Toronto power play before chipping a shot past Andersen's blocker. After Andersen had to be sharp on a couple Colorado chances as Toronto barely touched the puck in the game's first two minutes, the Leafs had great looks on a power play. NOTES: Andersen had originally targeted Saturday's home game against Boston, only to be cut down by a flu bug. ... Leafs backup Garret Sparks, meanwhile, was back on the bench following five games out with a concussion. ... Michael Hutchinson, who started the last five outings for Toronto on an emergency basis with both Andersen and Sparks sidelined, was loaned to the AHL Marlies. ... Colorado's top line of Rantanen, Landeskog and Nathan MacKinnon came in with 185 points on the season. Rantanen and MacKinnon ranked second and fifth in league scoring, respectively, while Landeskog was 19th.